You need an example of Wright's architecture on the Roycroft grounds. The Wright studio -- it would be a shame to call it an office -- is very Roycroftie." To which Hubbard responded, "I am glad to say that I know about the work of brother Wright of Oak Park. He certainly is a genius in his line and no man admires him more than I. Second, Evelyn (Heath) Jacobsen (Elbert Hubbard's niece) recalled in an interview with me in 1990, when she was 94, that she remembered Wright and Hubbard meeting in her family's Wright-designed William R. Heath House in Buffalo, but unfortunately she did not elaborate. 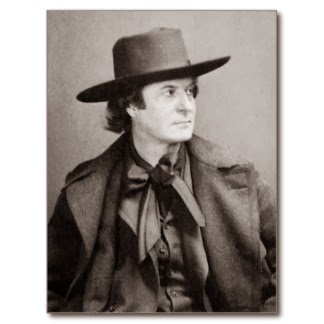 Elbert Hubbard was almost as picturesque as Father -- they talked arts, crafts and philosophy by the hour. Said Elbert the Hubbard to the Papa one night, 'Modesty being egotism turned wrong side out, let me say here that I am an orator, a great orator! I have health, gesture, imagination, voice, vocabulary, taste, ideas -- I acknowledge it myself. What I lack in shape I make up in nerve...' Said Dad the papa to the Hubbard, 'Not only do I intend to be the greatest architect who ever lived but the greatest architect who will ever live. Yes, I intend to be the greatest architect of all time, and I do hereunto affix 'the red square' and sign my name to this warning.' Just a couple of boys trying to get along." Elbert Hubbard perished on the Lusitania in 1915 but in the late 1920s, when Wright was being pursued by legal authorities, he deposited Olgivanna Milanov Hinzenberg, soon to be his third wife, and her child at Hubbard's Roycroft Inn in East Aurora. At the studio about this time came also, Roy Crofters, Elbert Hubbard and relatives, and others involved in the English William Morris School of Arts and Crafts, and Architect, C.R. Ashbee and his wife. Mr Ashbee later designed the first building for Tel Aviv in Israel. 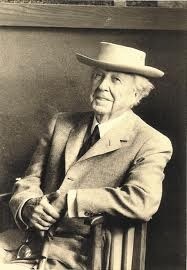 He and his wife visited us in Oak Park about 1896 and taught us children, four of us then, the Morris songs and dances..."
But more about Frank Lloyd Wright. Father had the capacity (mother thought it a fault) of attracting unusual and creative people. He loved discussions of the philosophy of life, of religion, of purpose and would sometimes stay up late talking with someone with whom he felt at ease. Sometimes these men had one eye on his financial help. so it was with frank Lloyd Wright, though I believe that Wright was challenged by father's skepticism and argumentativeness... Mother was always gracious to these people but recognized their divided intentions and would warn father. The Heath home was something of a hotbed of interesting discourse. The record shows that when Walter V. Davidson joined the Larkin Company in 1906 he and his wife were invited to the Heath home on at least two occasions to discuss the writings of Ralph Waldo Emerson. Wright did lean on the Heaths (and the Martins and other prominent clients) in times of need so it is not unlikely that Elbert Hubbard and Frank Lloyd Wright did engage in lengthy discussion in the Heath House though perhaps not the way that John Wright has portrayed it.